What types of community service will I be doing? For 10 days, through the Koby Mandell Foundation teens will run day camps for children who have been affected by the Middle East conflict and for Ethiopian Immigrants who live in an absorption community. Other community service opportunities include working with various Israeli service agencies such as Leket Israel, local children’s hospitals and localized community outreach. Teens will earn over 40 hours of community service. What is the Koby Mandell Foundation? An Israel based organization brought to life by Seth & Sherry Mandell in memory of the son Koby. Thirteen year old Koby was murdered by terrorists near his home in Israel in 2001. The foundation creates and operates programs that encourage other struck by terror to live meaningful, healthy and inspired lives. 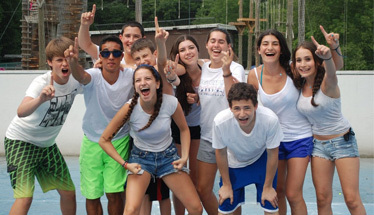 The Koby Mandell Foundation works with the NJY Camps in coordinating trip logistics, community service, administration, support and security. For more information on the foundation and the programs they offer please visit there website www.kobymandell.org. While traveling Israel, campers and staff sleep in 3 Star hotels/youth hostels or Kibutz Guest Houses. Room capacity differs at each hotel, however most sleep 4-6 campers per room. A list of hotels will be available a few months before departure. Bed linens and blankets are always supplied for each camper. How is security & safety handled? Our first concern is the security of every participant of our program. The campers will travel with the group at all times. We will tour the country on our own coach bus from the time the group arrives in Israel and until it departs. Participants of the program will not use public transportation while in Israel. At all times, the Koby Mandell Foundation staff will monitor where our group travels and will follow security guidelines established by the Jewish Agency of Israel. One staff member is an Israeli armed guard/medic and will always be with the group. Safety and taking precautionary measures is our number 1 priority. Can I visit my family & friends in Israel? We recommend enhancing your child’s visit to Israel by pre-arranging with us and your relatives and/or close friends to participate in the “free weekend options” Teens will be picked up and dropped off at several places in Israel. We will send out a form on the application where you can let us know who you will be staying with, so start planning now! As many of our campers do not have family is Israel, we will have organized programs during this weekend and will have our campers stay with the staff from Koby Mandell and NJY. What is the Gadna add-on option? Gadna is a new program add-on. 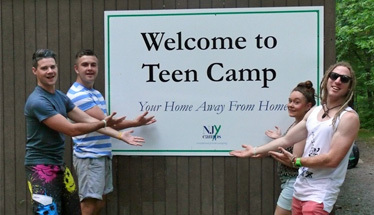 It will give campers the option of extending their trip for an extra week to remain in Israel. Campers will live the life of an Israeli soldier on a real Tzahal Army base. Campers will wear the Tzahal uniform and follow a regimented routine, featuring shooting practice, self-defense courses and the daily duties of a soldier. This is a program that is very popular with touring groups of teenagers and will no doubt be a great addition to our trip. How can I communicate with my family back home? Participants are encouraged to apply for a cell phone through a cell phone company in Israel associated with the Koby Mandell Foundation. Campers will receive the cell phone as soon as they land in Israel. The rental fee is inexpensive and we will provide you details in the spring on how to do this. It will be much cheaper than taking a US cell phone to Israel as Israeli cell phones all have free incoming calls. Computer and Internet access is limited around the country. Laptops are prohibited and other expensive portable electronic devices are strongly recommend to remain safely at home. What areas of Israel will I be traveling to? Extensive travel includes full exploration of Israel from north to south and east to west. Highlights include Jerusalem, Eilat & the Negev, Tel Aviv, the Galil, the Golan Heights, Masada & the Dead Sea. Sight seeing and adventure at Ein Gedi, Camel rides, water sports, Latrun, Kotel Tunnels, the shuk, Palmach Museum, water hikes, jeep rides, kayaks, Yad Vashem, caves, Alyalon Bullet Factory, boat cruises on the Red Sea and Kinneret. Please ask to see our full itinerary. Round trip airfare, 3 meals a day (breakfast, lunch, & dinner), snacks, admission and entry fees into all parks, museums, entertainment, etc., hotel accommodations for the duration of the trip, guided tours & hikes, a bus for those children returning back to camp from the airport, a private coach bus, transportation and so much more. What’s next? How can I apply? You can apply by registering directly on our website or downloading a paper application from our website. After each camper fills out an application they will be contacted by the director to begin the application process. Campers are required to submit two letters of recommendation, a phone interview, passport photos, and summer program ideas/plans.